Barangay Bongbongon was a two-hour drive south of Roxas, Capiz on the Island of Panay. The highway there was only partial paved, so at least half the trip was a narrow muddy dirt road. But the trip was well worth the trials of the journey. The people of the community were eagerly awaiting our arrival. There are very few health care services, so Doctor Jinky’s arrival was a great blessing. 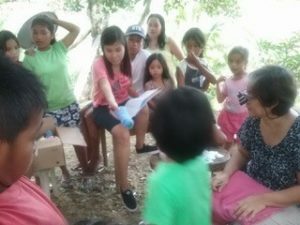 For two days, Jinky and Memma taught basic hygiene, handed out dental kits, and performed basic dentistry. One of the highlights was being able to pray for each child by name and letting them know that Jesus was there with them. The team also brought a Vacation Bible School for the children of the community as part of our Church Plant. We were able to finalize the Sewing Machine livelihood project. We also purchased two sewing machines for two church families who will make various backpacks, bags, and purses. All in all, we felt like Paul and Barnabas and Silas, traveling dusty and muddy roads bringing healing, helping, and the Good News of Jesus Christ. Please continue to pray for the dear souls of the families in Bongbongan as we continue to teach and train and share the Love of Christ and the Good News of Salvation.